At Bullfrog Pool Service, we are dedicated to all aspects of swimming pool safety. Below are some tips on how to keep you and your family safe and healthy in and around commercial and residential swimming pool and spa facilities. 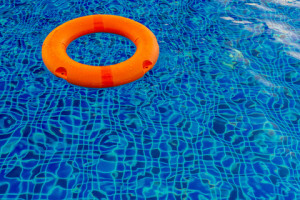 When entering a swimming pool area, make yourself aware of the location of lifesaving equipment and emergency supplies. Pay attention to the various pool rules signs and obey them. Make sure the swimming pool water is clear, clean and the drain covers on the bottom of the pool are clearly visible. Keep close watch on children at all times while in pool area. Never swim alone no matter what your age, experience or skill. Do not dive into water less than 5 feet deep. As a member of the APSP, we are very concerned about the safety of our customers and their families. Child drowning is the leading cause of injury death for young children ages 1 to 4, and three children die every day as a result of drowning according to the CDC website here. The APSP supports the concept of “layers of protection” which is defined as “deploying several devices to delay unsupervised access or to warn of a child’s presence.” That concept is laid out here on their website. Some examples of layers include adult supervision, safety pool fencing, automatic safety covers, locking spa covers, alarms such as door and exit gate, fence and water level sensor alarms, safety rope and float line, and a safety ring buoy. 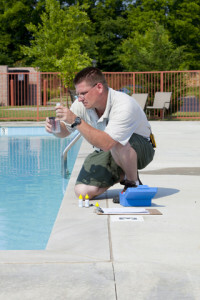 When choosing a pool service and maintenance provider in the Wilmington, NC area, make sure their team is well-versed in proper water chemistry. There are plenty of safety concerns associated with improper water chemistry. A very high chlorine or bromine content can cause problems such as skin and eye irritation; very low pH levels can do the same thing. Cold weather blues? Spring countdown begins!